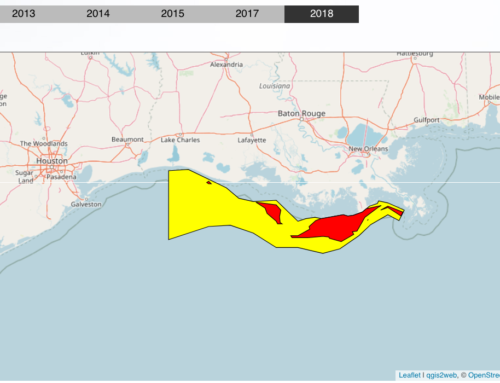 The eight-day research cruise aimed at mapping the size of the summertime “dead zone” along Louisiana’s coast has been cancelled for the first time in 27 years. The National Oceanic and Atmospheric Administration‘s 187-foot ship Nancy Foster encountered engine trouble, agency officials announced Friday (July 29). 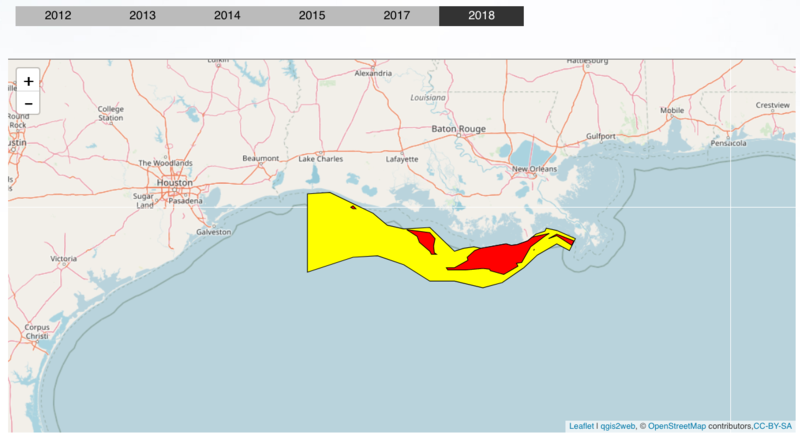 The cruise was expected to determine whether researchers were accurate in June in estimating that this year’s low oxygen area in the Gulf of Mexico would cover 5,898 to 6,824 square miles. That’s the size of Connecticut and a bit larger than the 2015 area of hypoxia. 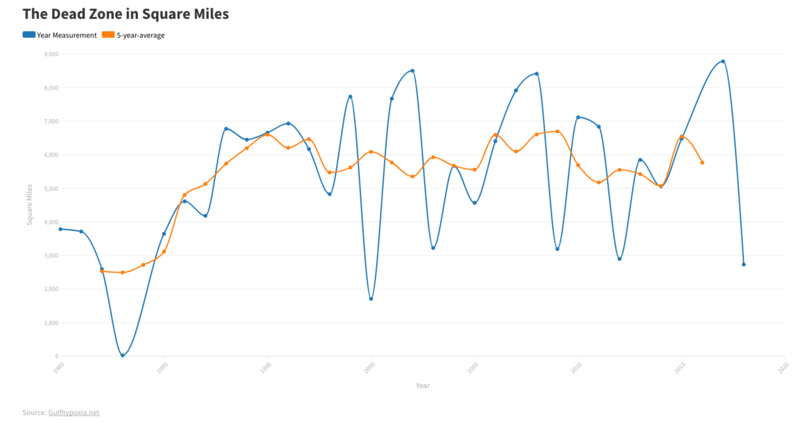 Oxygen concentrations along the Louisiana and Texas coast measured during the July 28-August 3, 2015, monitoring cruise. The Dead Zone, where oxygen concentrations were 2 parts per million or lower along the water bottom, was 6,474 square miles. Hypoxia refers to water that contains 2 parts per million or fewer of oxygen. 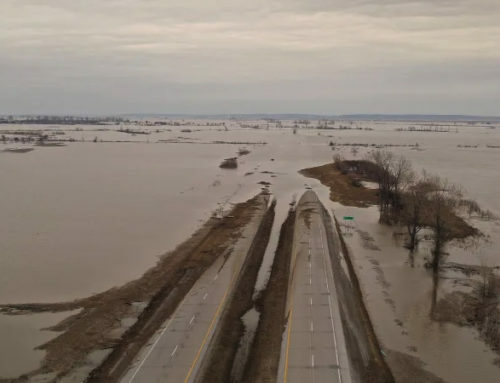 It is formed when spring floodwaters rich in phosphorus and nitrogen from the Mississippi and Atchafalaya rivers flow into the near-shore waters of the Gulf of Mexico. The nutrients feed large blooms of algae that soon die and sink to the bottom along the shoreline, where its decomposition uses up oxygen. Fish tend to avoid low-oxygen areas. Organisms that live in the bottom sediment are killed. This would have been the first time that Louisiana Universities Marine Consortium scientist Nancy Rabalais and her team of hypoxia researchers used a National Oceanic and Atmospheric Administration ship for the cruise. The federal agency made the ship’s use a condition of continued funding of the mapping project. The annual cruise is conducted through a partnership of the federal agency, the Northern Gulf Institute and marine consortium. This map shows the percentage of years that hypoxia — oxygen levels of 2 parts per million or less — were found along various locations on the coasts of Louisiana and Texas from 1985 to 2008. 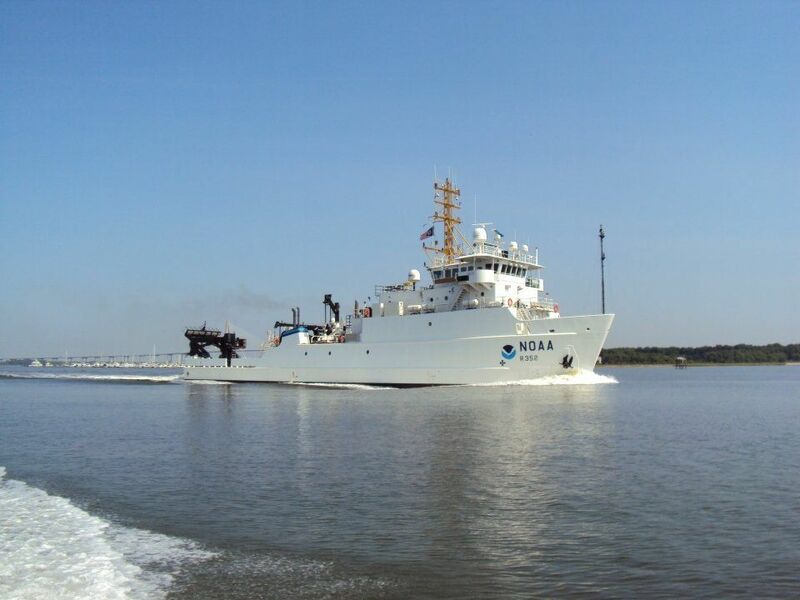 The Nancy Foster is one of 16 research ships in the federal agency’s fleet. It and one other ship are docked for unscheduled repairs, and two more are sidelined for scheduled maintenance, a spokesman said. 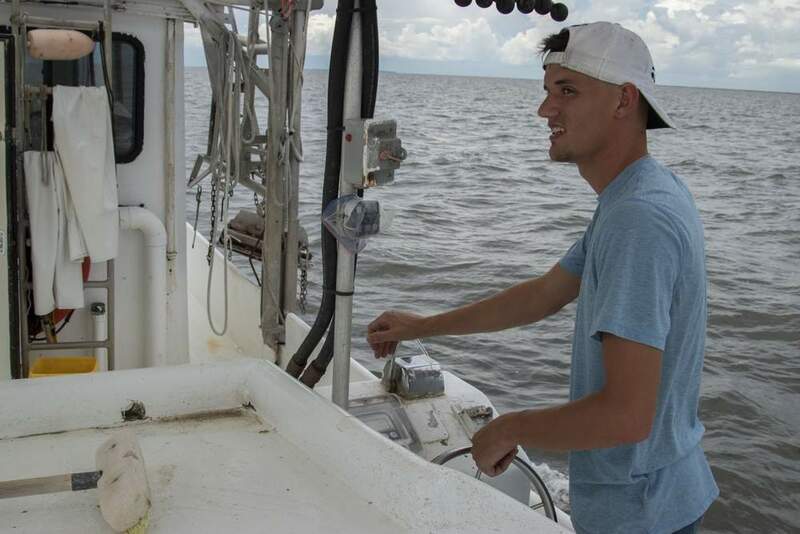 The dead zone team had used the RV Pelican and its predecessor, the RV Acadiana, research vessels stationed at the marine consortium at Cocodrie, during 29 of 30 years of cruises. In 1989, researchers conducted an abbreviated mapping effort. During the cruises, researchers take samples of water at various locations to determine the amount of oxygen at different water levels. They also sample algae and nutrients in the water. Rabalais said the Nancy Foster was originally supposed to head for the gulf on Sunday, but it broke down then. Then she received notice that the ship would attempt to start an abbreviated version of the cruise on Thursday, but the repairs were not completed in time. She said the research team checked with three other vessels, including the Pelican. All had already been booked for other research work in other locations. 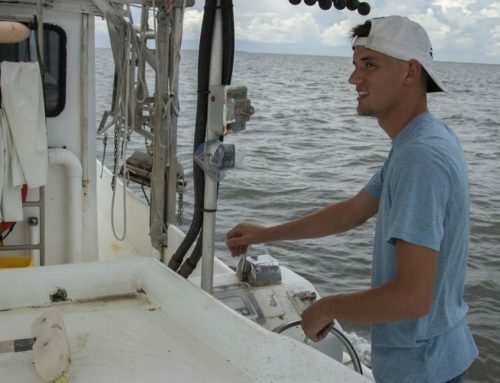 Rabalais said that even if the Nancy Foster had been used, it’s likely that measurements would not have been taken at a number of locations been monitored in previous years. That’s because the Nancy Foster’s draft is deeper than the Pelican, forcing it to stay in deeper water. Information from the annual cruises is used to provide a baseline of the extent of hypoxia in the gulf. 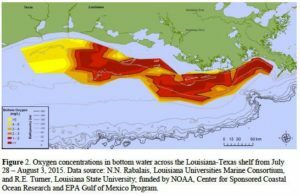 The data are used by the federal-state Mississippi River/Gulf of Mexico Watershed Nutrient Task Force, which is trying to find ways of reducing the dead zone’s size. The task force had set a goal of reducing the five-year running average of the hypoxic zone to 1,950 square miles by 2015. 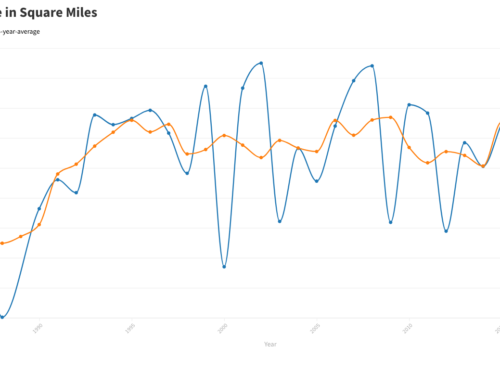 That has not been met: Between 1995 and 2015, the dead zone has averaged 5,941 square miles. 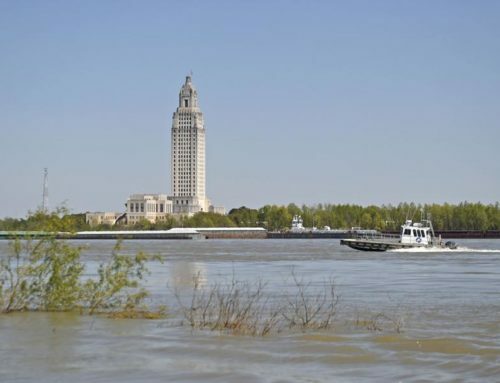 The June forecast of this year’s dead zone is the result of computer modeling that compares the nutrient content of water in the Mississippi and the size of the river flow in May to previous years. 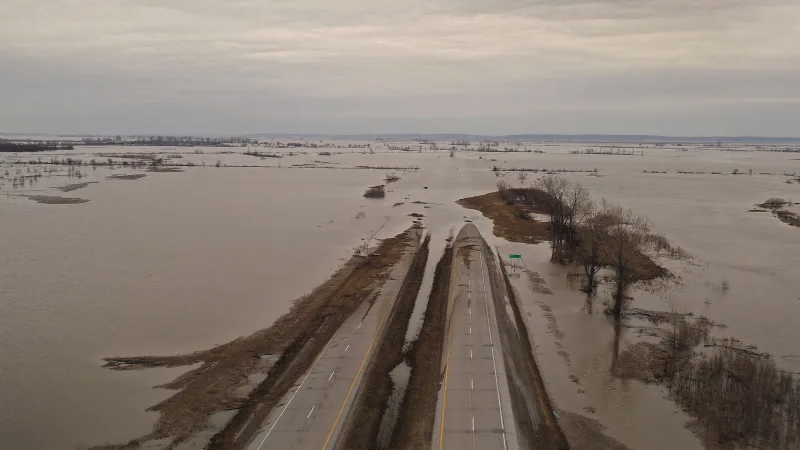 The nutrients come largely from fertilizers that are washed off farmland in the Midwest by spring rains, along with pollutants from sewage treatment plants, septic tanks and industries in the Mississippi’s watershed. According to the U.S. Geological Survey, concentrations of nitrate and nitrite at Baton Rouge were above average this past winter. In May, there were near the highest levels since the agency began measuring them in 1997.